I can't believe it's already Monday. I finally have a breather while writing this, after a crazy weekend full of our Friendsgiving preparations and get together. All of the work that went into it was totally worth it. I'll be posting lots of photos and recipes later on this week. In the meantime, here's our latest vegan Thanksgiving side recipe for the Free People blog. This is a particularly easy recipe to incorporate to the meal especially if you're accommodating vegan diets. The beans are quite basic to prepare, while the Roasted Lemon Gremolata is the real hero of the dish. You'll probably start dipping everything else in it. This recipe serves 4 generously, but the proportions can be easily adjusted to feed a larger crowd. Set broiler in oven to high. 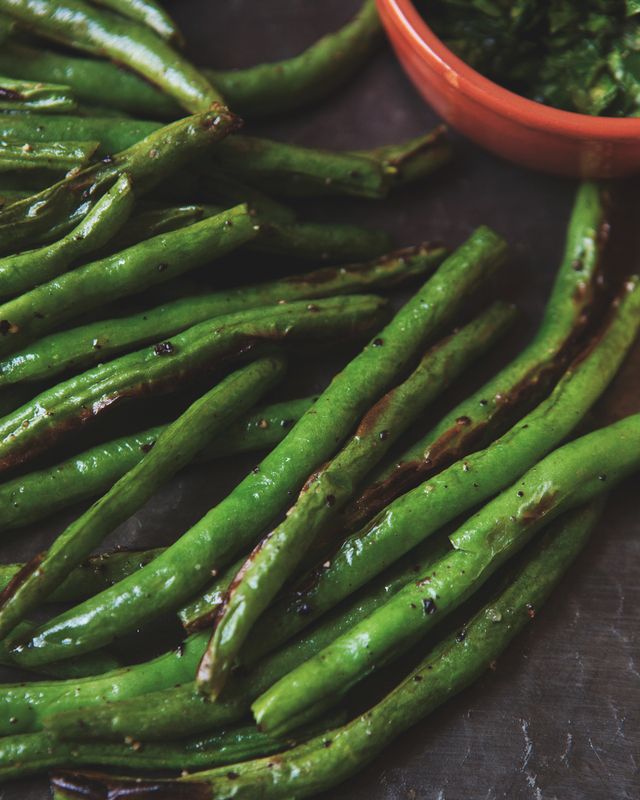 While heating, toss green beans with olive oil, garlic powder, salt and pepper. Place on baking sheet. Broil for 10 minutes, tossing at least once, until beans are tender and begin to blister. 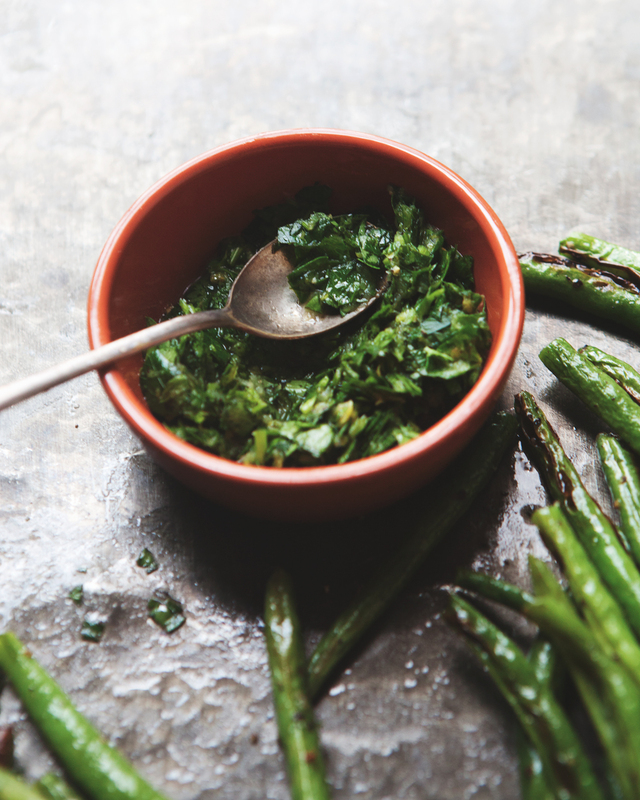 Serve immediately with generous spoonfuls of gremolata on top. Set broiler in oven to high. While heating, cut 1 lemon in half and place cut side up on baking sheet. Broil for 10-15 minutes until lemon begins to brown and blister. Set aside to cool. Chop parsley thoroughly until it is broken down into small pieces. Using a microplane grater, grate the garlic clove into parsley. Using the same grater, grate the zest from the unroasted lemon into garlic and parsely mixture. Chop mixture to combine and transfer to a small dish. Add juice of roasted lemon, olive oil, and salt and pepper. Mix to combine.